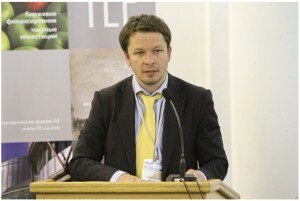 Maksym Kopeychykov made a report on the topic: «Transformation of land shares in land plots and registration of rights to them: implications for landlords and tenants» at the conference «Registration of rights to land: new rules for agribusiness», which was held within the framework of the XXV International Agricultural Exhibition «AGRO-2013». In the report Maksym said that «Lease of land shares or land plots is the most common interaction pattern between the owner of agricultural land and the business entity that actually works on it. The significant amount of land plots have not been formed yet and the owners have no state acts to them, as far as they receive certificates of title to land (which is the certificate of ownership since January 01, 2013) the land tenants will have to deal with the problems of continuous use of leased land plots of the so-called mutual investment fund and observation of rights of agricultural producers, because in many cases land owners try to blackmail the entrepreneurs that invested resources in the leased land for years threatening to lease the land to others. The introduction of the new rights registration system, including the right to land lease, on the one hand, will facilitate protection of the tenants, and on the other hand, due to some technical peculiarities of the registration system, can increase costs of tenants or even enable landlords to change the insufficiently generous tenants». The participants of the discussion of the most urgent problems for the industry were: Evgen Pershykov, judge of the HCCU, and his colleagues, Vasyl Yaroshovets, First Deputy Chairman of the Agrarian Union of Ukraine, Oleg Boychuk, counsel at Egorov, Puginsky, Afanasiev & Partners Law Offices and the representatives of the agricultural sector.